I suggested my posts on Free Trade during the show. Here a series of posts that might be helpful. So now that we are to the round of 16, I think my reply to Sanjay Reddy's question can be evaluated. Note that from the 16, 5 are from Latin America (Argentina, Brazil, Colombia, Mexico, and Uruguay), one from Asia (Japan) and 10 from Europe (Belgium, Croatia, Denmark, England, France, Portugal, Russia, Spain, Sweden, and Switzerland). Of those 6 have already won a World Cup (Argentina, Brazil, England, France, Spain and Uruguay) and 1 played at least a final (Sweden, lost against Brazil in 1958). Note that no countries from the Middle East or Africa passed the initial phase. There is a good chance that the winner will be a previous champion. I wouldn't discount the possibility of a new champion, but in that case the likelihood is that it would be another European team (my bets would be on Portugal if CR7 plays incredibly for te rest of the tournament, or Russia being at home). Probably less likely, a Latin American one could also win (if Mexico plays like it did with Germany). But the best bet would be a previous champion. Path dependency is really strong, and that suggests that games have been close not because the skills are more or less the same, but because it's relatively easy to play a defensive game and make it very hard for the good teams to move forward. I've been reading in the spare time (not as much as I would like, and worse with the World Cup) Louis Uchitelle's Making It: Why Manufacturing Still Matters. I tend to agree with the general idea of the book and with many of the policy conclusions, even though I have some problems with minor points (for another post). As a result of this I went to check manufacturing output. There are many different statistics to check in the FRED database. Below a measure of industrial output. And yes, it is below the peak from the previous recession. We were talking about this with Tom Palley, and it is clear to me that this statistics played an important role in the rise of left (Bernie) and right-wing (Trump) populism in the US. The failure of the Obama recovery to lift manufacturing, not just jobs, but output too is central to any political economy story about the last election. 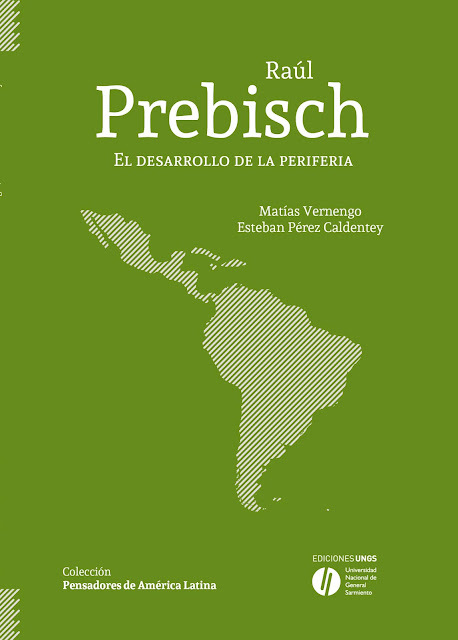 Our book is out (in Spanish). You can buy it here. We have written a few papers in English if you are interested available here, and here, for example. my review of Dosman's biography is available here. The World Cup is about to start. The Economist has run a piece suggesting that "the World Cup [is] the fulfillment of some of our most cherished values." And yes the cherished values are essentially free trade, the raison d'être for the creation of the magazine (that has a problem of self-image and refers to itself as a newspaper), and more generally laissez-faire capitalism, of which the publication is one of the most important cheerleaders. There are many of these, pardon the directness, garbage pieces that suggest that football (soccer for the gringos) explains the working of capitalism (see, for example, this popular book). And, yes, the most obvious explanation for the confusion is that football does not explain the market or globalization, or how the world works, or any other way of expressing modern capitalism. It's the other way round, capitalism explains football. Football can also teach countries how to spot and hone human capital. The best performers not only have systems for finding gifted children, but also ways of spotting late developers who failed to make the first cut. 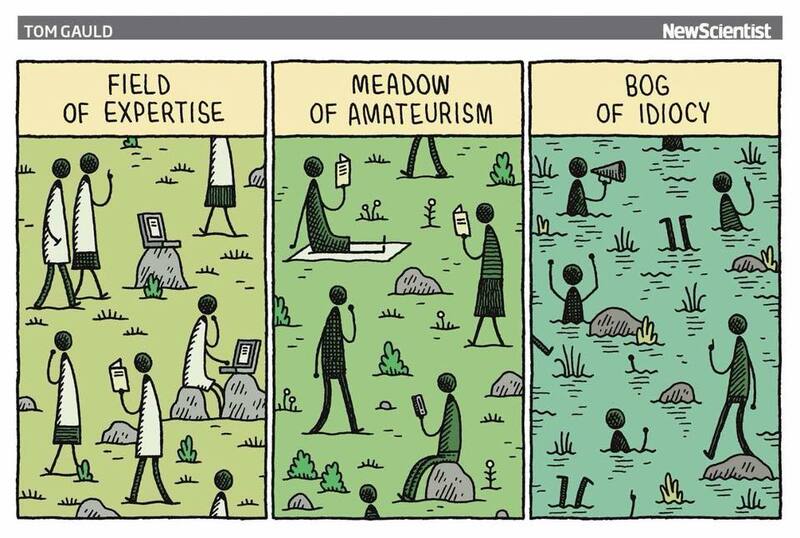 Their academies turn out intelligent, creative players rather than dribbling automatons. Then, if they are clever, they drop their best footballers into a competitive market. 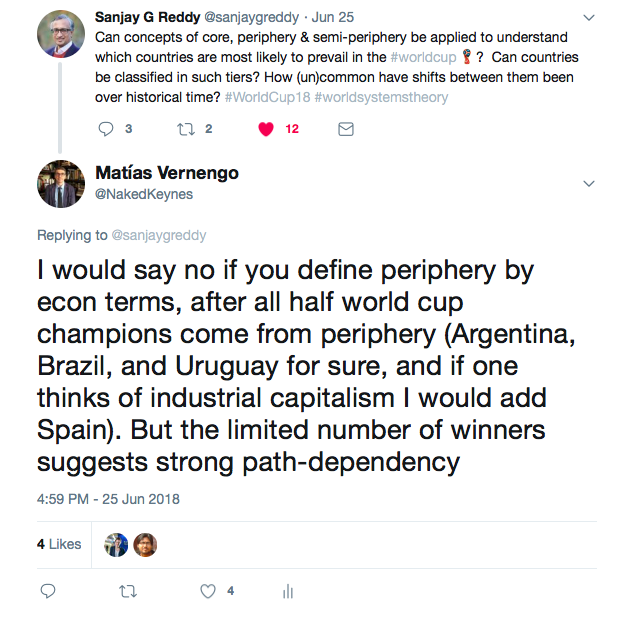 The idea is that in places where there are free market like mechanisms to find the best players you end up with the best teams that go on to win the World Cup. There are too many problems with this view, both with the view of how the economy and capitalism work, but also about football. I will tackle just a few. Think about the notion that markets select the winners, which are the best players, as an analogy of markets selecting the best firms, the best economic practices. Development is just a question of open and free (unregulated) markets. Yet, the actual record for that is thin at best. It is well known now that even the English experience that led to the Industrial Revolution (IR) in the 19th century was far from being a laissez-faire story. Not only the boom was related to a huge increase in the size of public debt, and the financing of a vast Fiscal-Military State, but also the size of the bureaucracy increased significantly. "British bureaucracy doubled in size during the 18th century. At the beginning of the century, state employees were estimated at 12,000, a number that had grown to 16,267 by 1797, and 24,598 by 1815," according to Roger Morriss. In other words, the state size doubled during the IR. Markets themselves require a significant amount of regulation. And here the example used by Ha-Joon Chang regarding child labor is always illustrative. Note that during the IR children were exploited working long hours in inhuman conditions (Hamilton suggested in his Report on Manufactures the positive effects of factories, since they would put idle children and women to work). Eventually, after a lot of social pressure (Marx and Engel's Manifesto demands the abolition of child labor) the freedom of firms to hire free willing children was curtailed. Markets are by definition a set of norms and regulations, and the very notion of a completely unregulated market is a bit of a ruse. Now let's think about football. What country has won the most, you ask. Brazil, with 5 wins in 1958, 1962, 1970, 1994 and 2002, and 2 final losses in 1950 and 1998. Note that Brazil is not a developed country. Nor the US, or Sweden (advanced economies, even if very disimilar in many ways) have ever won a (male) World Cup. The link between development, and the quality of the football played is not particularly strong. Also, I might add, World Cups are tournaments, with elimination games, subjected to chance and luck, and not championships in which every team plays against the other, and the winner is the one that won more points overall. Hungary in 1954, the Netherlands in 1974, Brazil in 1982, and Argentina in 2014 (that's my view, some might have different candidates) were, arguably, the best teams, but did not win the World Cup. The Economist tries to suggest that authoritarian regimes, with more closed societies, and one would assume markets, would do worse in the World Cup. They do say that "dictatorships are rubbish at football." And they note that Argentina in 1978, under General Videla, was the last time a country ruled by a dictatorship has won. The list should also include Italy in 1934 and 1938 under Mussolini, and Brazil in 1970 under General Medici. The argument is a bit hollow. Brazil, again, has won with both dictatorships and democratic governments (and so did Argentina in 1986 with Maradona and the return of democracy, which sadly doesn't win games). In all fairness, football has nothing to say about capitalism or why nations fail (or not). The development of capitalism, on the other hand, does say quite a bit about football. Football, or the rules set by the British in Victorian times, that have changed little, I might add, emerged during the first era of globalization. The game spread with the spread of English manufacturing products, and the trade routes. Teams often appeared in ports, like Boca and River in Buenos Aires, or Santos in Brazil. Also, the elites in developing countries copied not only the patterns of consumption of the wealthy in developed economies, but also their hobbies, and football spread to the posh clubs of developing countries. In that high class environment, black players were often discriminated. In Rio de Janeiro followers of Fluminense still are referred to as 'pó de arroz' (baby powder), since players of African descent tried to camouflage the color of their skin to be able to play (Vasco da Gama was the first team to field black players, in the 1920s). Football developed in places connected by trade with the British, and where patterns of consumption were being imitated, which explains why some parts of Latin America were early developers. Arguably, in many parts of Asia and Africa, income levels were too low for the patterns of consumption of the British upper classes to spread. Or in the United States the patterns of consumption followed their own trajectories, since at this point, the US was becoming the center of global consumption and imposing its own patterns of consumption on the globe. Accident, and history play a role. But it says a lot that the American version of football did not take off as the British one, meaning that institutions are path-dependent. 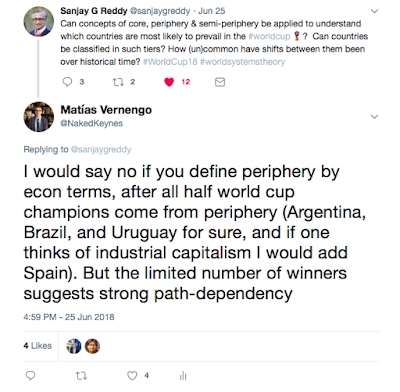 By the way, that path-dependency also explains why more or less the same national teams keep winning. Tradition is a very strong predictor of who would win the cup. Kids don't play football (soccer) in the US, since their sports icons are in other fields. By the 1920s football started to professionalize, and the markets, cherished by The Economist, for ball players became relevant. The professionalization of sports started in the 1920s, but the crisis of of capitalism in the 1930s, reduced the impetus of free market forces. Teams were not all powerful, and given the structure of clubs in many countries, football was not yet a business like the others. The backlash against capitalism meant that sports, and football were used by nationalist and populist (mostly right wing) regimes to promote national pride. Hitler, that was invested in the success of the Olympic Games in Berlin in 1936, wanted to win the World Cup in France in 1938, but Mussolini's Italy thwarted his plans. It is with the end of World War II and the victory of the allies, and the with the rise of American hegemony, that football slowly becomes a business like any other. The fundamental impulse for the changes came after the collapse of Bretton Woods, and the Neoliberal turn in the global economy. Increasing market integration and financial deregulation, facilitated the rise of modern football. Clubs became business, with the rise of the European super leagues, imitating the US market. Note that this is the period of the rise of American football (with the creation of the Super Bowl in 1967) and the professionalization of tennis (the 1970s). Even the US tried to develop a market in the 1970s, with Pelé joining the New York Cosmos. Players were bought and sold in markets, and still are. In the early times, rarely a player would become even moderately wealthy. Several players that would put to shame even the great of these days ended in poverty (Mané Garrincha comes to mind). Very few players are unionized, and most of them do not make the huge amounts of a Messi or a Neymar. Not only, free markets are not a solution for the wealth of nations, but the free market model for football has been detrimental for players and for the sport. Something similar could be said about other sports (I'm thinking about the NBA finals, and the overwhelming dominance of the Warriors). At any rate, The Economist should stick closer to their field of expertise. PS: I'll probably blog a bit more about football during the World Cup. 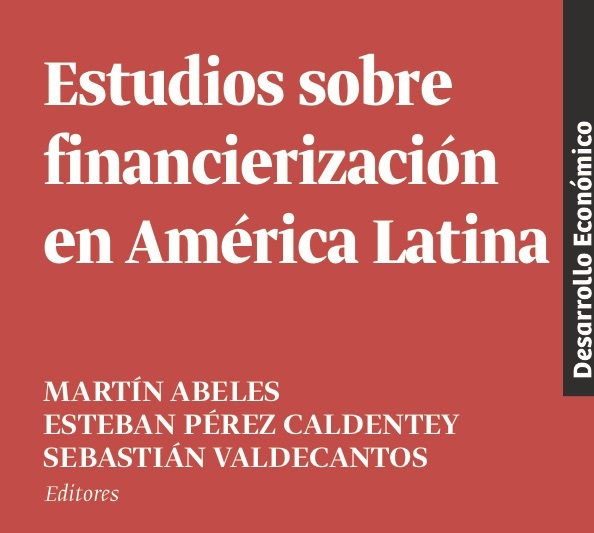 The chapters in the book analyze the logic and effects of financialization in developing economies, peripheral financialization so to speak, in particular in Latin America. 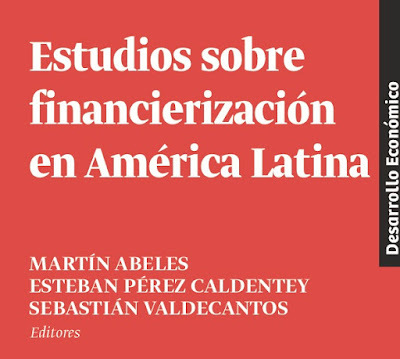 The first chapters look at the topic from a historical and conceptual angles, and then the latter chapters concentrate on specific manifestations like the influence of financialization on productive investment, spending on Research and Development (R&D), the characteristics of Foreign Direct Investment (FDI), monetary policy management, and the composition of foreign debt. The variety of approaches utilized in this volume reflect ECLAC's historical preoccupation of analyzing the condition that would make possible a macroeconomics at the service of economic development.